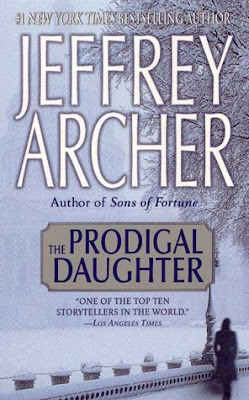 After reading Kane and Abel, I could not resist picking up The Prodigal Daughter which is the second book of the Kane and Abel series. While the first book revolved around the rivalry of Richard Kane and Abel Rosnovski, The Prodigal Daughter centers around Abel's daughter Florentyna. Florentyna is a smart and intelligent child. She shares her father vision and love for America and secretly wishes to become the first lady president of the United States of America. The novel takes us through her birth, childhood, education, love, marriage, motherhood, career, politics and finally her rise to the highest office of America. This book actually fell short in my expectation. I was looking for something as compelling, if not more than Kane and Abel. Kane and Abel was fast paced, had a lot of twists and turns in plot, there was always an air of tension and apprehension through out the book which kept me glued to it. I found it lacking in this book. From the beginning I knew Florentyna would make it big in life. Although there had been a lot of ups and downs in her life too, I could guess where she would end up. The book is written in such a way that even if you have not read Kane and Abel, you will be able to follow the story easily. That becomes a demerit for one who has read Kane and Abel, as a good part of the first half seems to be lifted from it. I would have enjoyed the book more if I had read it as a stand alone book.